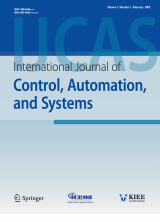 Abstract : "This paper proposes the robust model predictive control of positive time-delay systems with interval and polytopic uncertainties, respectively. The model predictive control framework consists of linear constraint, linear performance index, linear Lyapunov function, linear programming algorithm, and cone invariant set. By virtue of matrix decomposition technique, robust model predictive controllers of interval and polytopic positive systems with multiple state delays are designed, respectively. A multi step control strategy is utilized and a cone invariant set is constructed. Linear programming is used for the corresponding MPC conditions. Finally, a numerical example is given to verify the effectiveness of the proposed design." Keyword : Linear programming, robust model predictive control, time delay, uncertain positive systems.